There’s something about the fall weather that always inspires me when it comes to getting creative. I don’t know if it’s the anticipation of making Christmas gifts, or if I’ve just given myself a long enough break over the summer that I’m ready to jump back into working on something new. I usually crochet something for our kids for Christmas. This year, our daughter has hinted at a crochet horse or elephant. I’m not sure about our son yet. Last year, I made our daughter some things to go with a stuffed dog she played with all the time, including a coat, bed, food and water bowls, and a blanket. I crocheted our son a large octopus (and I’m still amazed at the details in the pattern I followed). I’ve been taking portraits for our family since our son was two. Honestly, I didn’t start off all that interested in photography, it was more born out of necessity and later turned into a fun hobby. When our son was born, we took him in for portraits. That newborn session was fine, but every session after that was horrible. He would cry and cry. I remember the last time I took him in for a session and saw how miserable he was. That’s when I decided I would learn enough about photography to take my own portraits. That next year, we found out our son had autism and all of those details fell into place. I’m so thankful I made that decision to become the photographer for our family! When I first began to publish my books, I also considered taking the images for my book covers. 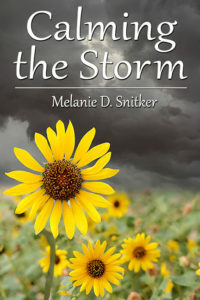 The very first cover for Calming the Storm was created by me with a combination of photographs I’d taken. While I loved the way it came out, and it was a lot of fun to make, I’ve since left cover design to an expert. I also enjoy making fun seasonal foods around this time of the year. From soups and stews for dinner to all the wonderful baking at Christmas, I probably do two or three times the amount of cooking October – December. I thought I’d share the recipe for one of the more unusual fall foods I try to make at least every other year. 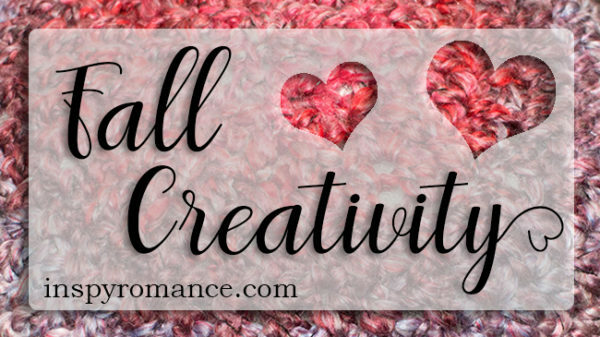 Do you find yourself feeling more creative during certain seasons of the year? What do you like to bake/cook/make, etc.? 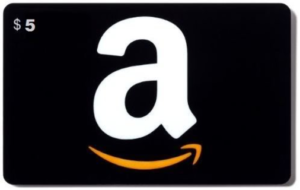 I’ll randomly choose one comment and that person will win a $5.00 Amazon gift card. A winner will be chosen Friday morning (October 27th) and contacted through e-mail. 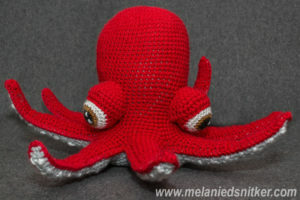 Hi Melanie, your crochet projects look and sound great- that octopus is awesome! My mum has tried repeatedly to teach me to crochet- I can do the basics, but have never attempted anything that complicated. Here in Australia, our main holiday period is over Christmas- our summer. It is in this season, when I have more time, that I cook more, work in the garden more and so on. Thank you! The octopus was so much fun to make. My mom taught me how to crochet when I was a kid. 12 years ago, I decided I wanted to get into some more complicated patterns. YouTube was my friend, that’s for sure! The Christmas season sounds wonderful there with nice weather and all. Hi Melanie! Thanks for sharing your creativity with your readers. Last year as we anticipated the birth of our fourth grandchild, I crocheted a baby blanket and hat in rose tones for baby Seeley Rose. For Christmas I crocheted each daughter-in-law a scarf. Unfortunately with an unseasonable mild winter, they never used them. I also enjoy cooking and baking. This fall we are still experiencing summer like temperatures in SW Michigan, so I haven’t done any fall baking. At almost the end of October and we still haven’t experienced a frost. As a retired teacher, I now use my creative skills to make finger play activities for my two granddaughters. Made a fence with popsicle sticks attached to a kleenex box and pumpkins on clip clothespins for Five Little Pumpkins. Yesterday I put together 40 Halloween Themed Thank YOU Goodie Bags for my daughter -in- law’s (principal) elementary school staff. I also enjoy taking family photos, especially of the grandchildren. Last week I took the two granddaughters to our local pumpkin patch for a photo shoot. Our 4 year old loves to look at all 8,000 photos on my phone. I often create brag books for family and friends to enjoy. The beautiful autumn colors of God’s creation and holidays approaching definitely gets the creative juices flowing. Best wishes and happy creating, whether baking, cooking, crafting, photography, or writing. The blanket and hat in rose tones sounds just beautiful! I love the baby’s name is Seeley Rose, how perfect! I hope you and your family have a lovely fall. I love that you all do so much together! oh my your octopus is so adorable. I love to sew, so throughout the year I will sew small projects for around the house and for gifts. I quilt baby quilts for family and friends. I also make my own greeting cards. these are all year round for me. Thank you, Lori! I admire that you know how to quilt. That’s a great idea to sew small projects throughout the year. Homemade greeting cards – how fun! I’m sure everyone who receives them appreciates it! The octopus is so cute! I don’t seem to be more creative during any particular season. I’m a quilter, so that’s what I always do when I’m feeling creative. That’s awesome that you’re a quilter. I’ve always wished I knew how to quilt. I admit I find the whole thing very overwhelming. To be able to make such beautiful things that people cherish for years is a blessing! Can’t wait to try your recipe, and your octopus is amazing! I like to make photo calendars for our family. Each day has a picture of the person having a birthday or anniversary on that day. Since I make it entirely at home, it takes me these 3 months to finish it. This year all of our children and grandchildren are coming for Thanksgiving, since the 7th grandchild is due around Christmas. I do all most all of the baking, so I definitely cook more these last months of the year. But the cooler weather makes the house so warm and cozy! With 6 kids, we couldn’t afford a photographer, so I took most of their pictures – even the graduation pictures. I’ve heard my kids say that they often don’t bother to take pics, because they know mom will. I often make a special book of photos as a Christmas present. Yes, these last months I seem to be more creative, but I LOVE this time of year! I did calendars like that for both sides of the family for about ten years! It was a lot of fun, but time-consuming, too! Though technically not a season, I’m most productive creatively on a rainy day. Thanks for sharing the recipe. Rainy days are perfect days to get things done – especially indoors! I like taking pictures, also, and each year I make a calendar for each of my girls at Christmas using some of those pics. That’s such a neat idea. I know our kids would love that. I may have to consider doing that this year! What a fun post! Your dinner-in-a-pumpkin is so much fun. When the weather cools, I usually pull out the knitting needles. This year, I’m making dishcloths… quick, easy, and good as small gifts. That’s awesome that you knit! I’ve always wanted to learn. I’ve tried, but I can’t seem to quite get it and always go back to crochet. Dishcloths are perfect for gifts! I like to cook and I seem to cook more in the fall and winter. I love pumpkin and your recipe sounds delicious. I will have to try it. 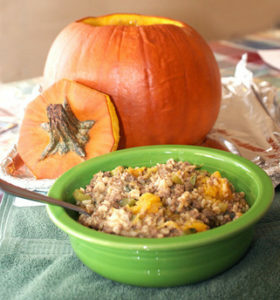 If you decide to try the pumpkin recipe, you’ll have to let me know what you think! These days I pour most of my creativity into writing and into photography. While I’m no pro, I do enjoy taking photos of our grandgirls and our travels. I have several photo books sitting at Costco waiting for me to make the four-hour round trip to pick them up! While I never got into knitting or crocheting, I did a lot of cross-stitch and sewing years ago. My eyes can’t see well enough anymore! Cross-stitch is just beautiful! I hope you try out the dinner-in-a-pumpkin. If you do, let me know what you think! I haven’t done much with my photography this year, but want to focus more on it. I need to do portraits of the kids and I always do our family portraits as well. I want to get back to more creative stuff, too. Soups are perfect this time of the year. Do you have a favorite birthday cake you make for yourself? Melanie let me know that her internet is extremely flaky today. She’ll get here when she can! You are so creative! I love all your projects. I really enjoy nature photography. I wish I were crafty in other ways, but my mom and daughter are. Thank you! They are a lot of fun. Nature photography is great. What camera do you use? I know that when it cools down, I bake a lot more cookies! :-) When I used to sit in a lot of meetings, I did a lot of counted cross stitch. I think I get more creative when I don’t have a lot on the schedule and can relax and think and dream. Mmmm cookies! I think it’s great that you cross stitch! This time of year when the weather gets cooler, which is saying a lot, because we live in Florida. My husband will make his famous turkey chili. It hits the spot and makes lots of left-overs. What a fun recipe! It sounds yummy. I’d better go grab a pumpkin before they’re all gone. I don’t really have a creative time of year. I’m going to have a lot of people here for Thanksgiving, though, so I guess I’d better get at least a little motivation and energy saved up. Most of them will probably bring things to share, so that helps a lot. I used to crochet a bit, but my fingers won’t cooperate anymore. Your octopus is adorable. Your Thanksgiving sounds like it’s going to be a wonderful one. It is helpful if people bring things to share so you’re not having to cook everything. I hope you have a blessed Thanksgiving! I was just talking with my mom this week about making Christmas stocking for my son’s first Christmas and a fake (Santa’s) beard (http://ashleemarie.com/double-loop-crochet-santa-beanie-pattern/). I’m not that handy (not even close to how much I’d like to be), but mom is. So we might be doing this. We were also planning Christmas baking (we do a lot of grandma’s family recipes so they take time and planning). I’m really looking forward to this. It’s a whole family ordeal. We were also considering making more Christmas straw stars. We have a couple but I really enjoy them in our Christmas tree. Those Christmas hats are adorable! All of the baking and the Christmas straw stars sounds like fun. I crochet and I always have a project going but four months or so before Christmas I start working on gifts for family, friends and neighbors. Last year I crocheted my grandson a shark blanket. I’ll bet the shark blanket turned out awesome. I’ve seen some patterns for that and they look neat! I love to bake apple pie! It’s just the perfect fall treat. Fresh baked apple pie. Oh yeah, that’s perfect for fall. Yum! I’m more creative in the winter as I have free time from gardening and canning. My hubby loves fall as I bake him sweet potato pies and pumpkin rolls. Gardening and canning definitely takes up a lot of time. It makes sense you have more free time in the winter. Pumpkin rolls sound yummy. I am not creative….would rather read a book! My Mom did the creative things, but not me! I love your pumpkin idea and admire your crocheting. I love that little octopus. I don’t crochet or knit. I love to bake, cooking comes second. Once colder weather hits, I feel like I have more time to do both since I don’t have to spend hours cutting grass or weeding my large garden. I like to make muffins and loaves, and, of course, bake lots of cookies and treats for Christmas. Thank you, Arletta! Muffins, loaves, and cookies. All great things to bake. Mmm! Your octopus is amazing. After moving I’m finally settled enough to sew. I’m having fun with that. When the weather turns cooler I enjoy baking. That’s great you’re having fun with sewing. I wish I did more of that! I loved seeing your octopus. When the weather turns cooler, as it has here lately in Iowa, I like to make soups and do baking. I liked your idea of a meal in a pumpkin. The recipe looks really good and will have to try it. I am glad to meet you also on this site. Blessings to you and your family. Hi Donna! I’m glad to meet you as well. If you try the recipe, let me know what you think of it! My boys used to think I could crochet anything. I made crocheted ladders from crochet thread for their GIJoe helicopter, a crocheted robot, all kinds of animals. A small tony the tiger blanket, Lots of afghans for gifts and coasters using old discarded CD’s. For myself, I made a lot of fancy barbie clothes, being the only female in the house, I had to do something girly. I’ve made a few things for the grandchildren, a little pony, and some clothes when they were smaller. Our second christmas was overseas, with my hubby in the army, so I ended up making some decorations for the holidays. At 63 I’ve slowed down, but I spend more time reading, or on the computer. Thanks for this opportunity. I love that your boys used to think you could crochet anything! <3 <3 My kids feel the same way for me. I'll get my daughter coming in wondering if I can make her doll a blanket or crochet a coat for her rabbit. LOL My son asks for animals, usually. I like that they do! Making decorations is a great idea! Great octopus! I do some crochet. I think the last thing I made was last Christmas. : a scarf for my 100 year old Mother! I do cross-stitch but my eyes are getting bad for close work. Last week I was working on some fabric pumpkins and potholders for the craft sale at church this Saturday. Then I came home from Bible Study on Wednesday and there was a pattern and note from hubby requesting a tea cozy with a matching potholder to keep off the chill from the counter! Well, I quilted that and it turned out pretty cute. Today I worked on more pumpkins, potholders and a wreath for Christmas. But before all that I finished reading Pepper a Basham’s A Twist of Faith! I’m sure you’ll find something equally unique to crochet this year! Happy crafting! When I am creative, I love to bake and my favorite thing to bake(and share)is cookies. I also love to curl up/sit and cozy up with wonderful and great books to read. I have tried to crochet… need a little bit ore practice. Crochet takes practice, but after a while, you barely have to look at it! Mmmm on the cookies! I usually have more creativity when I’m on vacation, when I have more time left. I wish I was more handy, so I’m trying to learn things from my mom like crochet and sewing. I think Christmas is the time of year when I actually exploit more my creative traces because I like to do things for my friends, so I’ve talked to my mom and she had some ideas on pinterest of gifts I could do with her sewing machine (that’s faster than crochet). Also near Christmas we bake family recipes and that’s a lot of fun, everybody gets involved and we laugh a lot and have a nice family day together. That’s a great idea to look at Pinterest for gift ideas. Family recipes – how fun! Especially when everyone gets involved. I love that! I feel i am more creative during the fall/winter. I guess because I’m thinking about it more.